^ 1.0 1.1 Stacey Jones. Accenture Chairman & CEO Pierre Nanterme Steps Down for Health Reasons David Rowland Appointed Interim Chief Executive Officer Marge Magner Named Non-Executive Chair. 11 January 2019 [11 January 2019]. 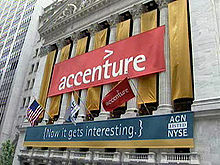 ^ About Accenture. [10 December 2015]. ^ 3.0 3.1 3.2 3.3 3.4 Accenture Q4 FY 2018 performance. Accenture.com. [27 September 2018]. ^ Fact sheet. Accenture. [11 January 2019]. ^ Accenture Fact Sheet 互联网档案馆的存檔，存档日期2014-01-15. This page is based on the Wikipedia article 埃森哲; it is used under the Creative Commons Attribution-ShareAlike 3.0 Unported License (CC-BY-SA). You may redistribute it, verbatim or modified, providing that you comply with the terms of the CC-BY-SA.